Far East Mobility completed a Cities Development Initiative for Asia Feasibility Study for bus priority, parking and non-motorized transport improvements in Yangon during 2018. Yangon is the main city in Myanmar, accounting for around a quarter of national GDP, and buses are by far the main mode of transport in Yangon, accounting for around three-quarters of all motor vehicle passenger trips in the Pyay Road corridor. A Cities Development Initiative for Asia (CDIA) project was completed by Far East Mobility in 2018 to carry out a feasibility study for bus priority, traffic management, parking and pedestrian facility improvements in Yangon, focusing on the Pyay Road corridor and downtown. The proposed Busway corridor features bus routes carrying a third of all bus trips in Yangon and would constitute the most important high-capacity Busway corridor in Asia since the Guangzhou BRT in 2010. Busway corridor and project scope. Yangon is developing rapidly, and experiences severe peak hour traffic congestion that is increasingly extending to the whole day. Buses are the main mode of non-walking transport in the city (see an example of the mode share at Hledan below), and though there have been improvements with new bus procurement and bus service frequency is high, bus speeds are low and declining. On a range of questions only a very low percentage of bus passengers surveyed in mid-2018 rates the bus system to be ‘very good’. Buses account for the large majority of trips in the corridor throughout the day. Bus passengers providing the highest 'very good' or 'strongly agree' ratings in surveys of perceptions of public transport. If the project is implemented, all of these measures are expected to increase to at least 30%. With the increasing use of cars and taxis, both bus and traffic speeds can be expected to continue to decline unless measures are taken to change the situation. Current bus speeds are shown following in the morning peak inbound and evening peak outbound directions. Bus congestion at Hledan junction in Yangon. Conditions for bus passengers and pedestrians in Insein Road. Bus congestion in Sule Pagoda Road in the CBD. Bus congestion at Sule Pagoda. Bus speeds are low in the Pyay Road corridor. The Yangon Region Government (YRG) has been interested in improving the bus system and implementing bus priority measures in the Pyay Road corridor since at least 2015, and a Yangon urban transport master plan developed by the Japan International Cooperation Agency (JICA) in 2014 identified the Pyay Road corridor as a future Bus Rapid Transit (BRT) corridor. A brief preliminary assessment funded by Asian Development Bank (ADB) technical assistance further identified the potential of bus priority measures in the Pyay Road corridor, and the Yangon City Mayor requested CDIA assistance with developing a Concept Design and Feasibility Study for the corridor in 2017. CDIA with the ADB selected consultants, Far East Mobility, through a competitive bid. The consultants were mobilized in mid-December 2017 and carried out the data collection, planning and design of the proposed improvements during 2018. Minor land acquisition is required in only two locations near Hledan intersection and the Hanthawady Roundabout, both on government-owned land. In the Busway Concept Design development one of the most immediate tasks was to verify that a Busway can physically be implemented in the corridor, noting the limited road width in many locations. This was confirmed, with solutions developed for all critical sections and intersections along the Busway corridor. The approach in Insein South road includes a shared bus and taxi lane, and minor land acquisition is required in only two locations near Hledan intersection and the Hanthawady Roundabout, both on government-owned land. The proposed Busway will benefit mixed traffic as well as buses. The project will include intersection improvements at Hledan, Hanthaway and other intersections along the corridor, delivering large improvements to both bus and mixed traffic performance. Intersection proposals for Hledan and the Hanthawady Roundabout are shown in simulations at www.fareast.mobi/yangon/sims, and the reductions in delay of the intersections along the corridor is shown below. The improvements for mixed traffic are enhanced by the operational design analysis which shows that it will be possible to have only Busway buses operating in the Busway corridors. Regular bus stops will no longer be needed along the Busway corridors, except for late evening services when the Busway stations are closed. Thus, mixed traffic will no longer be obstructed by stopping buses. Intersection improvements will greatly increase mixed traffic speeds. AM peak bus boarding and alighting. Yangon has around 2.4 million daily bus boardings, 13% of which take place in the CBD. The Pyay Road corridor is shown in green. Busway routes will account for a third of citywide bus demand. Demand profiles were developed for all Busway routes. The Busway routes will account for a third of citywide bus boardings. The proposed Busway will be a major mass transit corridor in Yangon, with the system’s 20 routes carrying around 840,000 passenger boardings on Busway routes per day just based on current ridership levels. (The actual ridership is expected to be higher than present demand due to population and economic growth, mode shift and attraction from other corridors, though the circular railway upgrades will likely take away some passengers.) Around one-third of all bus passenger boardings in Yangon will be on Busway buses and routes. A passenger using the full corridor will save 26 minutes in on-bus travel time in the AM peak and 26 minutes in the PM peak... Pasengers will also save time by a reduction of thousands of transfers per hour into and out of the CBD. The proposed Busway will dramatically improve bus speeds, as shown below. Bus speeds will increase by 56% to around 23 km/hr in the AM peak north-south direction, and by 54% to around 22 km/hr in the PM peak south to north direction. Based on current bus speeds, a passenger using the full corridor will save 26 minutes in on-bus travel time in the AM peak and 26 minutes in the PM peak, for a daily time saving of 52 minutes. Additional time savings will be achieved through more predictable waiting times. Pasengers will also save time by a reduction of thousands of transfers per hour into and out of the CBD and due to more reliable waiting times. The proposed Busway would produce dramatic bus speed improvements. The proposed Busway will also greatly benefit bus operators and drivers, and will provide a basis for the YRG to further modernize and professionalize bus operations. The more than 50% faster operational speeds in the corridor will translate into bus fleet and operational costs savings, as the higher speeds mean that the same number of passengers can be served with fewer buses. With high speeds possible in the corridor even as citywide congestion increases, the Pyay Road corridor will provide a stable rather than declining market for bus services. Bus drivers, meanwhile, will benefit from improved driving conditions and better facilities associated with more professional operations in the corridor. The proposed Busway will alleviate and largely eliminate (at least in the western CBD) one of Yangon’s most pressing urban development issues, which is the large number of forced bus passenger transfers on the edge of the CBD. With greatly improved traffic operation and Busway station capacity, Busway routes will be able to extend into the central CBD without adversely impacting mixed traffic, removing the need for passengers going to the CBD to transfer in the western CBD. Just calling the project a ‘bus priority’ project does not by itself mean that bus priority will be achieved, as poorly performing BRT systems in Hanoi, Kuala Lumpur and Bangkok show. The proposed Busway, with its high capacity design able to accommodate both conventional 12m and larger 18m buses in future, and with stations able to be relatively easily extended to ‘full BRT’ if future demand requires it, will also meet the future development needs of Yangon without becoming over-saturated even as demand increases. The proposed Busway features a high capacity design and consists of a hybrid of ‘full BRT’ and ‘Busway’ stations. All stations can accommodate both 12m and 18m buses. Station platforms will be able to accommodate six stopping 12 buses simultaneously, or twelve in the two platforms. ‘Full BRT’ stations are proposed for eight of the highest demand stations and involve pre-board fare collection, where passengers pay to enter the station rather than upon boarding the bus, and enclosed platforms with sliding doors. Busway stations, proposed for the remaining 19 stations, do not have pre-board fare collection, sliding doors or fare gates. The Busway stations are in turn divided into expandable and non-expandable stations. The 14 expandable stations will have the same footprint as a ‘full BRT’ station, so that if in future it is required to upgrade the stations to ‘full BRT’, this can be relatively easily accomplished. The remaining six non-extendible stations are not considered necessary for upgrading to full BRT in future and have a smaller footprint. The station types are shown below. Realistic renderings were prepared showing both the Busway stations and pedestrian facility improvements. The stations are all median-aligned, which eliminates conflicts with right turning or stopping vehicles, and feature a directional design in which buses stop on both sides of the platform. The stations will require approximately 400 new buses with doors in both sides of the bus, but will also be able to accommodate existing buses with right-side doors only, with the total Busway bus fleet likely to consist around 400 existing buses and 400 new Busway buses. The Busway will have around 20 routes. (The final operational plan will be devised later, likely during the construction phase of the project.) 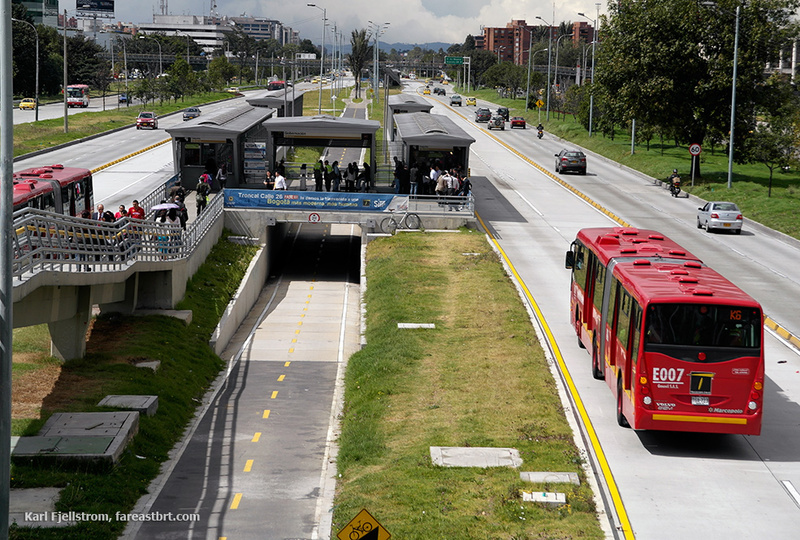 Busway buses will enter and leave the Busway corridor, with no transfer terminals or interchanges needed. Busway routes will be based on current routes, with some adjustments made primarily to increase the portion of Busway routes operating in the Busway corridor and to improve CBD access. The required route adjustments as well as the demand profiles of each route are explained in the report. As a package the Busway, parking and pedestrian facility improvement measures will dramatically improve the transport situation in the central area. It must be noted that for the Busway to deliver any of these positive outcomes, excellent planning and design is required. Just calling the project a ‘bus priority’ project does not by itself mean that bus priority will be achieved, as poorly performing BRT systems in Hanoi, Kuala Lumpur and Bangkok show. The need for excellent planning and design is especially acute in the Pyay Road corridor where, unlike in the other regional examples mentioned, very high bus and passenger flows leave little margin for error. Busway station renderings, including Hledan (Pyay Rd/Insein Rd), Maha Myaing (Pyay Road), and Thein Gyee Zay (Downtown). Since they were planned and designed as an integrated package, the project will ensure that the parking and pedestrian facility improvements are compatible with the bus priority measures. This compatibility is an important outcome, because parking improvements adopted without consideration of the requirements for transit stations could prevent or complicate Busway implementation, as could changes to intersections and walkways undertaken without consideration of bus priority requirements. As a package, the Busway, parking and pedestrian facility improvement measures will dramatically improve the transport situation in the central area, making the CBD more accessible and attractive and providing a model for urban transport improvements in other parts of the city. An initial on-street parking price of 600 kyats per hour (or 10 kyats per minute) is proposed. On-street parking system revenues in the Zone B central zone in the CBD will produce a revenue stream that could total around US$10 million annually which is proposed to be allocated to urban transport improvements, and even with a reduction in some locations such as adjacent to Busway stations, parking availability will be significantly more convenient with the approximately one-third of spaces used for long term vehicle storage prioritized for more productive shorter term parking. The definition of 8,920 parking spaces in Zone B is less than the current supply of 10,837 spaces, but parking accessibility will be greatly improved through a reduction in occupancy from near 100% in many areas to a target of 85% occupancy, achieved through on-street parking pricing. An on-street parking price in the Zone B central area will involve greatly reduced space allocation for delivery vehicles and taxis to 10% and 5% respectively in Zone B, as delivery vehicles do not need to park for long periods and taxis need to stop in the paid parking zone only to drop off and pick up passengers. An initial on-street parking price of 600 kyats per hour (or 10 kyats per minute) is proposed, with demand closely monitored during the implementation, with a goal of achieving around 85% parking occupancy. Pedestrians crossing Pyay Road at a pedestrian crossing in front of the Taw Win Centre in Yangon. Parking, Busway and pedestrian facility improvement areas in the CBD. Reforms to off-street parking are proposed to include a special zone around Busway stations allowing less (or no) off-street parking in new developments, and application of parking caps rather than parking minimums. This will bring Yangon into line with best practices in Transit Oriented Development internationally. The way the project is defined will help the government to get public support for the paid parking. Presenting the parking reforms as part of a series of measures including improved streetscapes, bus priority and other improvements, and using the parking revenues to contribute to the cost of these CBD improvements, will make the parking price application more acceptable and easier to promote to the public. The parking improvements will also benefit pedestrians, with the clear identification of parking spaces allowing pedestrian spaces in turn to be clearly defined and demarcated with bollards and other physical barriers to illegal parking encroachment. Pedestrians will benefit from safe crossings, improved and less-crowded walkways (with bus passengers waiting in the median) and Busway corridor access improvements, as well as much more convenient and attractive walking conditions in the CBD. The proposed pedestrian facility improvements include walkway widening achieved through bollards and kerb extensions, pedestrian crossing improvements at intersections and mid-block locations, reconfiguration of the parking, traffic and walkway layout on selected streets, kerb extensions and bulb-outs, speed humps and tables, road medians and refuge islands, pavement improvements along sections of the Busway corridor, and access improvements to Busway stations on high pedestrian flow roadways. Pedestrians will benefit from much-improved road crossings, improved and less-crowded walkways (with bus passengers waiting in the median rather than on the walkway) and Busway corridor access improvements, as well as much more convenient and attractive walking conditions in the CBD area. Pedestrian injury and fatality data was not available, but the project will greatly reduce injuries and fatalities through intersection and crossing improvements. Businesses along and around the corridor and in the CBD will benefit from the improved parking availability and transit accessibility and the more attractive walking environment in the central area. The combination of these parking and pedestrian facility improvements, also including the Busway, can be seen in the provided renderings. The project will also greatly improve conditions for pedestrians along the Busway corridor, with corridor access improvements provided in 14 access roads with high pedestrian volumes. As well as benefiting pedestrians, these access improvements will effectively increase the catchment area and ridership of the Busway. Pedestrians accessing the Pyay Road corridor are currently forced onto the roadway. Design improvements are proposed in 14 access roadways to the corridor as part of the project. The Busway, pedestrian facility and parking improvements are estimated to cost US$183.37 million, as summarized in Table 1. This is the total amount including investments from private or outside sources that will not rely on government funds. For example, the parking system costs of US$6.13 million can almost certainly be covered by a private operator without requiring government funding. Table 1: Summary of cost components. Table 1 includes a large allocation for buses ($50 million) and depots ($10 million) which has not yet been defined both in terms of the amount required, and the proportion of such funding that can be expected to come from private companies. These amounts can be considered an upper limit. Noting that the Busway will not become operational for at least three years, much of the required bus procurement can potentially be carried out as part of the routine ongoing bus procurement by operators, and may not require public funds. Since buses have doors in both sides, they can operate at regular bus stops before the Busway opens. Far East Mobility working with the Guangzhou Municipal Engineering Design and Research Institute (GMEDRI) and Guangzhou Tianchi Survey Technology Co. carried out an inventory of utilities along the corridor and in the CBD, and developed a strategy and cost estimate for dealing with utilities as part of the Busway implementation. Utilities costs including required moving of several transformers in the CBD are estimated to be around $2 million for the corridor. However, the government may consider upgrading utilities along the entire corridor. In this case implementation will be more difficult, with construction impacts along the whole corridor rather than primarily at station areas, and the cost of utilities will increase to $10 million, but the utilities improvement will better serve future development needs. This optional additional utilities investment is not included in Table 1. It is likely that the small amount of government land required for the Hledan and Hanthawady intersection improvements can be provided at no cost. If the project is approved by YRG, the immediate next steps required for the project during 2019 should include project preparatory technical assistance studies relating to environmental and social impact analysis, pre-engineering design, detailed engineering design, follow-up studies relating to Busway network planning, parking and pedestrian facility improvements in the CBD area, and ongoing capacity building. While there are 14 existing operators in the corridor, services in the new system will likely be bid out in five or so packages resulting in five operating consortia in the corridor. Some smaller operators will need to merge with larger operators in order to attain fleet sizes and ancillary facilities such as depot space required to competitively bid. Additional depot facilities will need to be located and built, likely together with additions and improvements to the CNG refuelling infrastructure. The YRG is the primary decision-making body, and the Yangon City Development Committee (YCDC) will be the primary implementation body for the construction stages. A Busway project combined with parking and pedestrian facility improvements has many components, and not all components will require immediate attention if the project is approved. (Since there are so many demands in such a project and local institutional capacity is limited, if some aspects can be deferred it is advisable to do so.) Aspects of the technical work that can be deferred include the final operational design, which is not required until the construction stages, which is also when the most intensive institutional capacity building will take place. If the project proceeds, a core project Working Group needs to be set up as soon as possible, consisting of representatives from YRG, YRTA, YCDC, and the traffic police. The Working Group should second officials from these agencies on a full-time basis and they should probably work out of the YCDC offices. If YRG proceed with the project, the follow-up studies could commence in early 2019, with recruitment of the detailed engineering design consultant in the second quarter of 2019. Detailed engineering design will take around one year, with construction potentially starting in the second quarter of 2021, which allows for a six month period of loan negotiation, parliament approval and loan signing and a further three month period for bid preparation in 2020. (It will be important to use this nine month period for ongoing Busway planning and design, rather than simply having the planning on-hold.) Construction is expected to take around 18 months, with operation of the Busway potentially commencing in late 2022. The main steps are outlined below. The pedestrian facility improvement implementation is generally more flexible and can be done before the Busway is operational, but since the Busway construction will impact on pedestrian facilities along the corridor, especially in station areas, it is recommended that the bulk of the pedestrian facility improvement implementation be carried out toward the end of the Busway construction period, with the new facilities completed during the ‘testing’ period after the Busway infrastructure is built but before it is operational. Regarding parking improvements especially in the CBD, the YRG and YCDC recognize the importance of immediate action in this area and are unlikely to be willing to wait until the Busway is operational in late 2022 to implement the paid parking reforms that have already been announced in the media for implementation in 2019. Provided the parking reforms take into account the parking space availability and locations defined by the Busway and pedestrian facility improvement project, and that such consideration is incorporated into the contractual conditions of the presumably multi-year parking operator appointment, the earlier implementation of paid parking measures in Zone B of the CBD should not be problematic. As part of the feasibility study, transport and economics analyses based on quite conservative assumptions were adopted. Despite these conservative assumptions, the proposed project is expected to yield an Economic Internal Rate of Return of 38%, substantially above the ADB’s 9% threshold. In addition, sensitivity tests and switching analyses showed that the proposed project scheme should be highly resilient to unforeseen increases in costs and/or decreases in benefits. As such, the Pyay Road Busway is strongly recommended in terms of economic feasibility. This article is adapted from the executive summary and parts of the main project report.